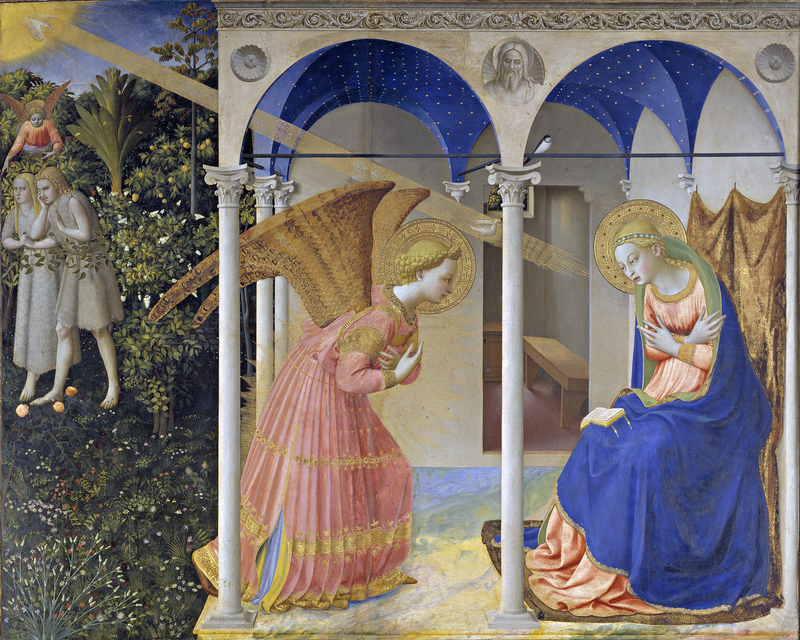 If you’ve ever taken Art History 101, you’ve seen The Virgin of the Annunciation by Fra Angelico. Not only is this one of the most famous examples of Italian Renaissance art, but it’s also just one of the most famous works of art, period. If it’s not obvious, it the scene where the Angel Michael tells Mary that she’s going to have a baby even though she’s never done the dirty. This painting is not famous because it is particularly skillfully done – it was done early on in the Renaissance, so the proportions are actually a bit off. If Mary were to stand up right now, she would smack her face on the ceiling because she is so tall. This painting is amazing in a lot of other ways. For instance, you’ll see that the vanishing point of the painting looks unnatural, but that’s because this painting is placed at the top of a staircase at the San Marco Museum in Florence, Italy. The vanishing point doesn’t make sense if you’re standing right in front of the piece at eye-level, but it does make sense when you look at it from the bottom of the stairs. Also because this piece was commissioned in 1440 by the Medici family, it contains some extraordinary materials that actually make the piece shimmer as you walk by. Nothing but the best for the Medicis, am I right? This piece was painted on the walls as the entire building was being renovated by the architect, Michelozzo di Bartolomeo. (Fun fact: this renovation included the building of the first library since antiquity.) Another cool thing about this painting is that it looks like it is set in the actual San Marco monastery. If it had been painted more realistically, then people might even have thought that the top of the stairs led to an outdoor space, but unfortunately Photorealism wouldn’t arrive on the scene for a few more centuries. This piece doesn’t have all of the symbols that usually fill an Annunciation scene, like white lilies to signify Mary’s virginity, or a Bible to symbolize her piousness. No, this work was made for the eyes of monks only, who knew this story like the back of their hand. They didn’t need to have anything hinted to them because they were experts. The bottom of the painting is inscribed with some long-winded Latin phrase that boils down to a reminder to pray everyday. Though I'm sure the monks did not need the reminder. The Annunciation is a panel-painting altarpiece or retable by Fra Angelico (tempera on panel, 154x194 cm the central panel, 194x194 including the predella) situated in the Museo del Prado of Madrid and created between the thirties of the 15th century. The work is probably the third of a series of great tables by Angelico representing the Annunciation; the other two are the Annunciation of Cortona and the Annunciation of San Giovanni Valdarno. Dating is not concordant and some art historians invert the sequence putting the Prado table at first. Check out the full Wikipedia article about Annunciation (Fra Angelico, Madrid).